The "Doppel Adler Musikanten" entertained members and guests of the Jasper Deutscher Verein Family Picnic. The picnic was held at the Jasper Outdoor Recreation Club on Saturday, September 20th. Over 175 members and guests attended. Members and guests were treated to roasted pork prepared by Jerry Lechner and Kevin Schuetter and club members brought in additional food. Ruth and Eb Reichmann, retired Professors from IUPUI, were presented with a certificate of appreciation for their efforts in identifying Pfaffenweiler as a possible Sister City for Jasper and for their continued promotion of the German heritage between Pfaffenweiler and Jasper. Presentation was made by Jim Gutgsell, President of Sister Cities of Jasper. Jim Gutgsell, Matthias Hilger, and Dan Gutgsell presented Drs. Eb and Ruth Reichmann a certificate of appreciation for their efforts on behalf of the Jasper-Pfaffenweiler Partnership. Matt Hilger, President of the Jasper Partnership Commission and Picnic Committee Chairman, thanked Picnic Committee members Bob Fleck, Patti Goepfrich, Dan and Kathy Gutgsell, Jim and Louise Gutgsell, Kathy Hilger, Tom and Jan Hulsman, Linus Lechner, Kim and Pat Lottes, and Jason and Amy Wanninger. And the welcoming committee consisting of Dolores Flannagan, Martina Eckert, and Joann Eckert. Bob Dilger, Vice President of the Deutscher Verein, then announced the upcoming club activities. On Monday, October 6th, the annual German American Day dinner will be held at the Schnitzelbank. The annual auction benefiting the JHS Exchange Program with Poesneck and Staufen Gymnasium will be held on Thursday, November 20th, at the Jasper VFW. Club members were encouraged to bring items of interest for the auction. Matt Hilger also announced some special items pertaining to the Jasper-Pfaffenweiler Partnership that will be sold to the highest bidder. The Christmas meeting will be held on December 11th at the Jasper Country Club. More details will be in upcoming newsletters. Members and guests are encouraged to attend all club activities. 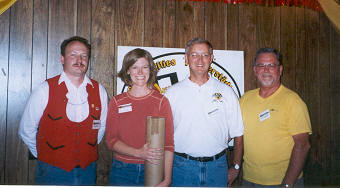 Dan Gutgsell, President of the Deutscher Verein, then introduced Dan Wehr, Chairman of the Strassenfest Booths. Dan gave information as to the success the Deutscher Verein had at the Strassenfest and thanked all members for their time and efforts in making the Deutscher Verein booths successful. He also announced that he and Linda will not be Chairmen for the 2004 Strassenfest and asked for club members to consider taking over these duties. President Gutgsell thanked Dan and Linda for their efforts these past two years on the Strassenfest. John and Julie Gutgsell were chairpersons of the Souvenir Booth for 2003 and have agreed to be chairpersons again in 2004. They were thanked for their efforts. Matt Hilger then introduced Julie Newton, JHS German Language teacher, and presented her with a check for $500 to benefit the JHS Student Exchange Program. Matthias Hilger, Dan Gutgsell, and Jim Gutgsell presented the JHS German Language teacher, Julie Newton, $500 for the JHS German Exchange Program. President Gutgsell recognized the guests present. Matt Hilger then introduced Martin Nonte from Germany who was in the area visiting Nonte relatives. Mr. Hilger also recognized Kathy Gutgsell for her efforts on the club newsletter and Bob and Betty Sunderman for beverages that were enjoyed during the evening. Wolfgang Erhardt won the ½ attendance prize. Attendance prizes were won by Al Schuler, Bob Sunderman, Phyllis Gilley, Ardella Johanneman, Marlene Greener, Ruth Reichmann, Richard Schmitt, and Edna Schiffer. The remainder of the evening was spent socializing and dancing to the music provided by "Doppel Adler Musikanten". A big "Thank You" to the whole set up team for this year’s family picnic. Everybody had only excellent comments about the evening - the decorations, the food and entertainment. The set up team consisted of Bob Fleck, Patti Goepfrich, Dan and Kathy Gutgsell, Jim and Louise Gutgsell, Kathy Hilger, Tom and Jan Hulsman, Linus Lechner, Kim and Pat Lottes and Jason and Amy Wanninger. The Welcoming Committee of Martina Eckert, Joann Eckert and Dolores Flannagan assured that all had the opportunity to sign up for the various upcoming activities and attendance prizes. The team made the picnic a very special one this year. Thank you for all your help. A special thank you goes to Bob and Betty Sunderman for making a very good batch of Pilsner beer for the evening. There was nothing left to take back. Also special thank you to Jerry Lechner and Kevin Schuetter who had a very long day preparing our grilled pig. We will have to fine-tune a few more things next year, but overall we believe this was a great family picnic. The Jasper Deutscher Verein, Sister Cities of Jasper, Inc., and The Jasper Partnership Commission sponsored a German-American Day Program October 6th at the Schnitzelbank Restaurant in Jasper. Over 95 individuals celebrated the occasion. Dan Gutgsell, president of the Jasper Deutscher Verein, welcomed all present and gave a brief history of the reason for the German-American Day. He introduced Mayor William J. Schmitt, who read the proclamation recognizing October 6th as German American Day in Jasper. Jim Gutgsell, president of Sister Cities of Jasper, Inc., introduced the essay winners of the "What German Heritage Means to Me" contest which was held in conjunction with German-American Day. This contest was open to all seniors in the four Dubois County high schools. Over 65 entries were received. The winners were Ashley Kaltenbacher of Southridge High School. Her parents are Joyce and John Kaltenbacher. The winner from Jasper High School was Anna Brewer and her parents are Jeff and Lisa Brewer. Anna Brier was the winner from Forest Park Junior-Senior High School and her parents are Susan and Kevin Brier. The winner from Northeast Dubois High School was Stephanie Cave. Stephanie is the daughter of Sandra Moore and the late Darren Cave. Each student presented her essay as part of the program of the evening. Teachers were also recognized. Essay Winners (L to R): Stephanie Cave (NEDHS), Anna Brewer (JHS), Ken Sendelweck (GAB), Anna Brier (FPHS), and Ashley Kaltenbacher (SHS). 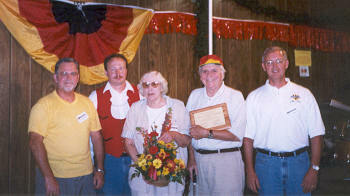 Matthias Hilger, president of The Jasper Partnership Commission, then presented the 5th annual German Heritage Award. This award is presented to an individual or group who has contributed generously of their time, talents, or resources in maintaining, improving, or building upon the German roots in Dubois County. Sister Cities of Jasper and the Jasper Partnership Commission created the award in 1999. The Jasper Deutscher Verein sponsored the award. This recognition is open to all people, not just residents of the City of Jasper, who give what they can in order to make a difference. A nomination will recognize the work of those who generously support the German heritage. A committee, consisting of the presidents of the Jasper Deutscher Verein, Sister Cities of Jasper, Inc., and the Jasper Partnership Commission, judges the nominations and selects the winner. 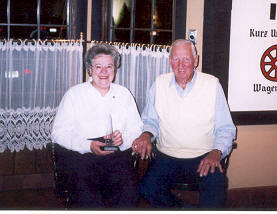 The 2003 German Heritage Award was presented to Joe and Irene Eckerle. Hilger noted the many areas that Mr. and Mrs. Eckerle have been active in supporting the German Heritage. They have hosted several individuals from Germany in their home, including one individual for 18 months. They welcome the opportunity to show German visitors the sights of Jasper and Dubois County. They promote the German language whenever possible and have visited Pfaffenweiler several times to visit and maintain relationships established in conjunction with the Jasper-Pfaffenweiler Partnership. Mr. Hilger also recognized those previously receiving the award, which includes Mary Jo Meuser, Claude and Martina Eckert, Dave Buehler and Linus and Sally Lechner. Ken Sendelweck, President/CEO, German American Bank then commented on the similarities of family, tradition, and work ethic in the essays presented by the students. On behalf of the German American Bank, he then presented each essay winner with a $250 scholarship. Dan Gutgsell then thanked the German American Bank for their financial assistance of the essay contest and for the help in organizing the contest and thanked all for attending the dinner and supporting the German Heritage. The remainder of the evening was spent socializing. The November meeting of the Deutscher Verein will be held at the Jasper VFW on Thursday, November 20th. Social hour begins at 6:00PM with appetizer and dessert buffet to follow at 6:30PM. Members with last names beginning A to J are asked to bring a dessert. Members with last names beginning K to Z are asked to bring an appetizer or snack. The club will provide refreshments. This meeting will include the annual auction benefiting the JHS German Student Exchange Program. Dan Hoffman will be the auctioneer for the event. Thanks to Tonya Brothers-Bridge and the Marketing Department of the German American Bank and Lois Kuntz for the support work provided for the German Heritage Dinner. Special thanks to the German American Bank for its support and promotion of the German Heritage Dinner and for being the financial sponsor of the Essay Contest. Members with last names beginning A-J are asked to bring a dessert and members with last names beginning K-Z are asked to bring an appetizer or snack. The club will provide beer and soft drinks. We will also be serving BBQ prepared at the September picnic. Dan Hoffman has graciously agreed to conduct our annual Auction of donated items with 100% of the proceeds donated to support the Jasper High School German Student Exchange Program. Everyone is encouraged to bring an item or two for this Auction. Please be generous! Remember – three Sister Cities signs will be auctioned off. Items from past years have included baked goods, crafts, furniture, homemade wine, German items, and Holiday items. Be creative – the more variety and quantity of items we have in the Auction, the more funds will be raised to support the Exchange Program. Come prepared to bid! The December meeting will be on Thursday, December 11th and will be our Annual Christmas Party at the Jasper Country Club. See the next newsletter for more details! A collage of more than 100 events for all ages, "Spirit and Place" serves as a city-wide conversation, guided by the theme: "Remembering & Reconciling." Friday, Nov. 14, 1-6 p.m.: Opening of Exhibit "Called to Service - The History and Work of the Benedictine Sister in Indiana" at the Payton Philanthropic Library in the University Library at Indiana University Purdue University Indianapolis. The Exhibit will depict through art, documents and artifacts the contributions of the Benedictine Sisters to education, music, and the arts. It will show their strong impact on religious life and education in Indiana since the founding of their Monastery in Ferdinand in 1867. The exhibit can be visited at the Payton Philanthropic Library during regular hours through February, 2004. Prof. of English at Long Island University. Reichmann will read from his "Hoosier German Tales." Norbert Krapf, a native of Jasper, will read from his latest book "The County I Come From." Held at the Indiana History Center, 450 W. Ohio Street, Indianapolis. For more info on "Spirit and Place"
Discover the charm of Olde World German Traditions! In Germany, Christmas wares and gifts are sold in the festival-like setting of Christkindlmarkt. This 14th century custom lives on today in Ferdinand, Indiana. Sample delectable foods and wines while shopping in an Olde World Christmas Aire. Visit the three Christkindlmarkt locations including the Ferdinand Community Center, Forest Park High School, and the Antiques Markt in the Monastery Immaculate Conception Gymnasium. Drive or take the trolley to charming shops within the scenic village of Ferdinand. Presentations by Eberhard and Ruth Reichmann, the German Heritage Folkdancers and Ron Dunbar’s Crossroads Brass of Terre Haute. The evening will feature German Christmas music, old German Advent songs, authentic German Folk Dances, Hoosier German Christmas stories an a sing-a-long in both English and German! The program will take place in the Main Dining Room where a dinner buffet will be served. The cost for the buffet and entertainment is $10.99 per person. Please make reservations in advance for the this exciting event by calling the Gasthof Restaurant at (812) 486-4900. Newport and Covington really have a lot to offer at Christmas. December 5 – 7 will be a weekend full of activities. Some of the offerings are the Christmas walk, where traditional German Christmas items will be for sale in the Bier Garden and Brunch with Santa on Sunday. Covington's Main Strasse Village is a great place for a charming afternoon and Newport on the Levee will have fun things also. Please check the Hofbrauhaus website (www.hofbrauhausnewport.com) for additional information. 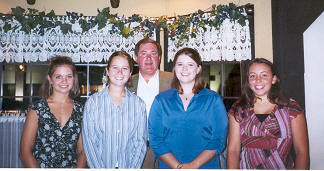 The German Club met on Thursday, November 19, 1987, at the Schnitzelbank Restaurant. President Bob Verkamp gave an update from the Strassenfest committee. Gov. Orr has declared 1988 as "Hoosier 88" year. Several new acts and activities are being proposed for next year. Claude Eckert reported that Pfaffenweiler, Germany, has been informed that as many as 80 travelers from Jasper may visit their city in September, 1988. He also reported on the Sister City Award recently presented to Jasper by Gov. Orr. Jasper and Fort Wayne were recognized for their outstanding Sister City relationship. Claude and Martina Eckert, along with several councilmen, accepted the award at the IUPUI campus. The club decided to rent warehouse space from Bernie Vogler. This will enable the club to keep equipment in one place. A survey indicating interest in German classes will again be included in the January and February newsletters. Marilyn Nathan, VUJC German teacher, has planned for various speakers for December 1, German Heritage Day. The program will be held at the downtown VUJC, the restored Gutzweiler Building across from the Jasper Public Library. The meeting will be held from 7 to 9 p.m.
President Verkamp reminded members that election of officers will be held in January. Anyone interested in running for office should contact a present officer or a member of the board of directors. Jasper High School German students spoke and gave a slide presentation of last summer’s trip to Germany. The students were Jon Fleck, Steven Kluemper, Dana Dupps, Christy Crockett, Karen Buechlein, Kristi Kuczynski, Sonya Huppe, Nancy Hulsman, Monique Winkler, Stephanie Brixey, Chris Friedman, Jay Bohnert, Michelle Luegers, Ann Verkamp, Jane Nordhoff, Danette Drone, and Stacey Weyer. Stan Krempp spoke briefly on his recent trip to Germany and his family history. A short film on Gov. Orr’s recent trip to Pfaffenweiler was shown. The next meeting will be the wine and cheese tasting night on January 22nd and will be hosted by Sally and Linus Lechner. Anyone wanting to purchase Pfaffenweiler wine glasses, Jasper High School German Club Advent calendars or books may contact Bob Verkamp or Mary Jo Meuser. In memory of Father Robert Greene, M.M. The JHS German Club is selling Avdent calendars until November 10th. To place an order, please contact Julie Newton at jnewton@gjcs.k12.in.us or at 482-1040.
consider the relevance of this important aspect of WWII to today's domestic and world events. and scholar of civil rights in the USA, as well as an author, will be the main speaker at the event. Other remarks will be delivered by German and Japanese American internees, and representatives of their respective groups. Panel discussions are also in the planning. German American organizations and societies are invited to participate and become local sponsors of the exhibition, and to help with outreach and publicity. I recently returned from the Black Forest in Germany. I had a free afternoon in Freiburg. I noted on a map that Pfaffenweiler was only 8 miles away. My father, Robert Merkley from Jasper told me to look for the old family home in Pfaffenweiler if I was there. Well, I thought I would be looking for a needle in a haystack but with an old photo of the house in hand I asked around the village where the Eckert House was located. I was directed to the Rathaus. They said it still existed and they pointed me up Weinstr. Well, I found the house and it looked the same as in the photograph I was carrying. It is a large house with a 15 foot cross on the front lawn. I took loads of Photos for my Dad. All I can say is for those who have not been to Pfaffenweiler go if you can, the people are very friendly and helpful. The club is in need of volunteers for several activities for the upcoming year. Dan and Linda Wehr have done an outstanding job of chairing the booths during Strassenfest for the past 2 years, but will not be able to continue that duty for the upcoming year. We need a person, a couple, or a group of individuals to step forward and assume the role of booth chairpersons. Dan has offered to help with the ordering of supplies and negotiating of terms with suppliers. We also need someone to organize the judging for the Annual Beer and Wine Tasting held at our January club meeting. If you are interested in helping the club in either capacity, please contact Dan Gutgsell at 482-4386.